Love bug and I had a blast learning about Brazil over the last two weeks (extended due to vacations)! 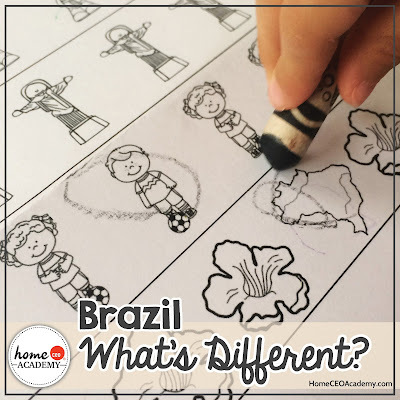 Brazil is week three of our 30 week homeschooling preschool curriculum. Here are some highlights of our activities! 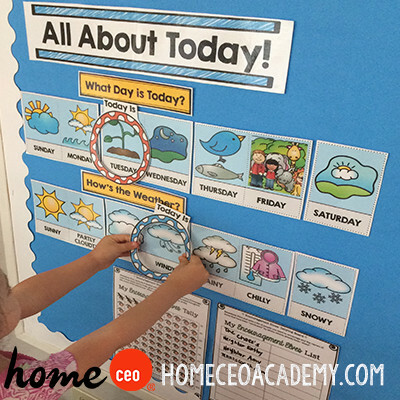 One thing I like to start the week off with is our weekly one-page lesson plan summary. I keep it in our homeschool room for easy reference. Here I have it propped up on a standing clip board. 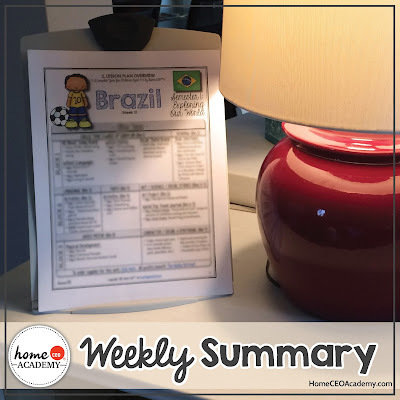 As we go through the activities throughout the week, I put little check marks to note that we've finished those activities and keep track of anything I need to make sure my little one completes. Here is our theme board for the week. After circle time, we hang up three new vocabulary cards and learn about landmarks and other interesting facts about Brazil. 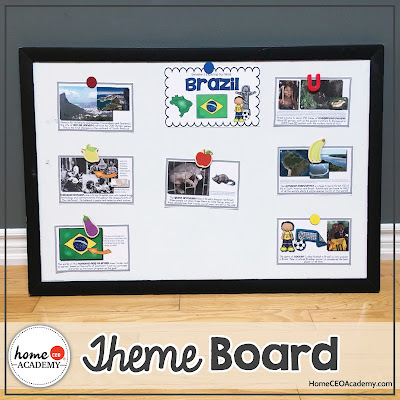 We also do a quick review of the cards we did previous days to remember the country flag and other major landmarks or characteristics of Brazil. I also pick up that plush globe you see in the background of that picture and show Lexi again where the country is. After our theme board is updated, we move on to our Wake Up Warm Up quick language and math drills. We have a piece of paper that tells us for each of the three homeschool days a week what to do for our warm up drills. 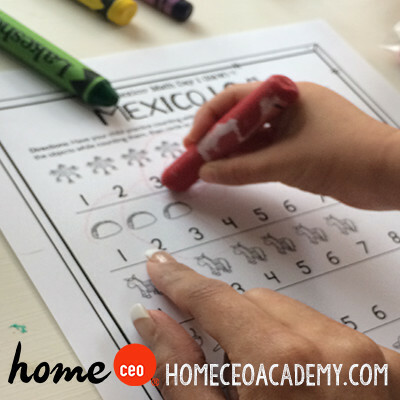 Sometimes, we will do more than three days and in those cases, we'll repeat days 1 and 2 drills for fluency. 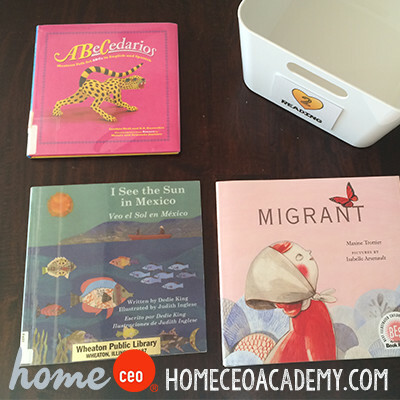 The library is a Home CEO's best friend! These are our reading selections for the unit. After we have updated our theme board and finish our Wake Up Warm Up activities for the day, we go sit in our favorite chair and read one of books for the week. We really liked "For the Love of Soccer" which was written by Pele, who is widely regarded as the greatest soccer player that ever lived who is from Brazil. 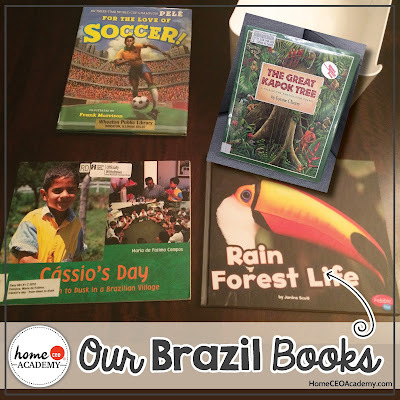 "Cassio's Day" was about a boy's daily life in Brazil. The sites and sounds of Brazil sure are different from life in Chicago, but in a lot of ways, our lives are very similar. We see where Cassio goes to school and spends time with his family. The last book, was a nonfiction selection about the rainforest. We pick up most of our books from our local library. 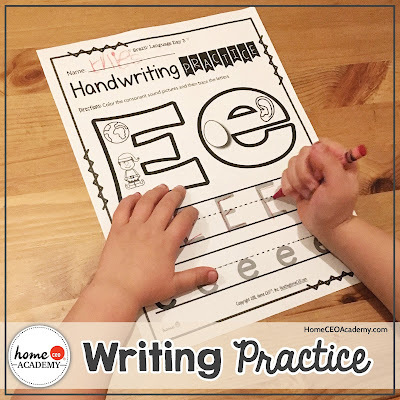 This week, we focused on the letters E and F. We practiced upper and lowercase tracing. 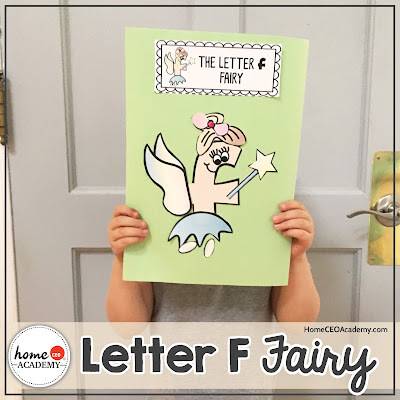 Then we made some letter crafts. These are always the highlight of our week! All aboard! 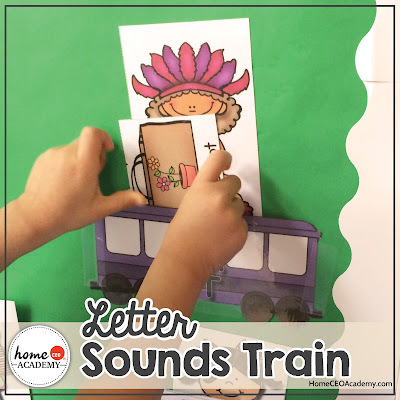 We met Enrique and Flora from Brazil to our ongoing letter sound train and placed their letter E and F letter sound luggage in their train cars. Our math activities for this unit included a tens frame activity. 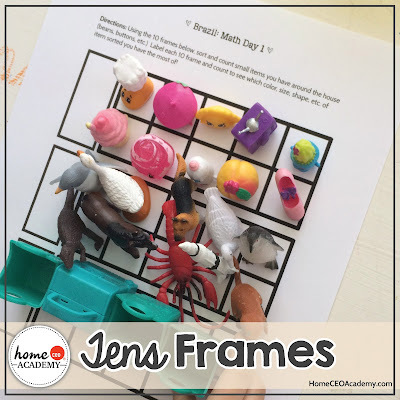 Kindergartens today often use a tens frame to teach base ten concepts. 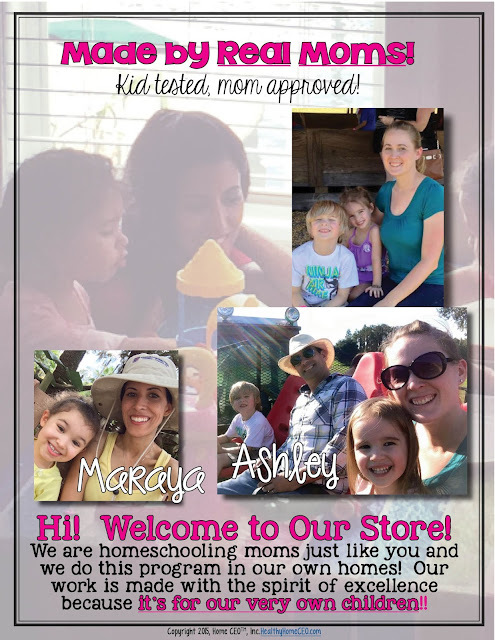 Here, we are just getting your little ones used to the idea. This open ended sorting activity was a lot of fun! 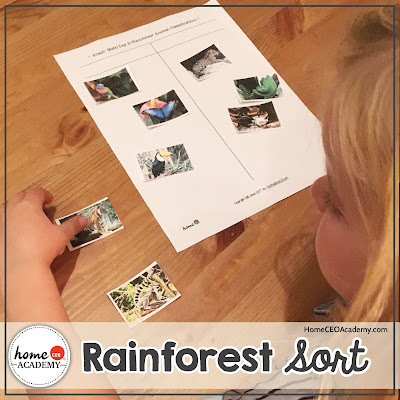 Ask you little one to sort the animal cards into "flies and does not fly" or "has fur and does not have fur." Here Lexi practices her writing skills (drawing circles) while identifying same and different. 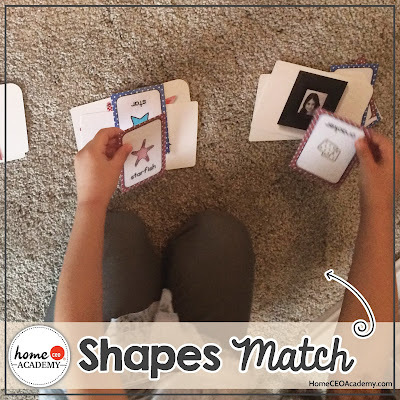 One of our daily Wake Up Warm Up math activities involved sorting and classifying these cards by shape. 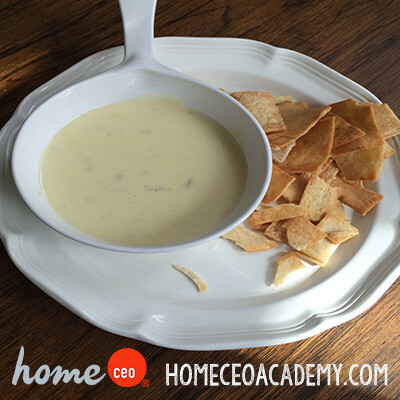 Homeschooling makes me hungry! 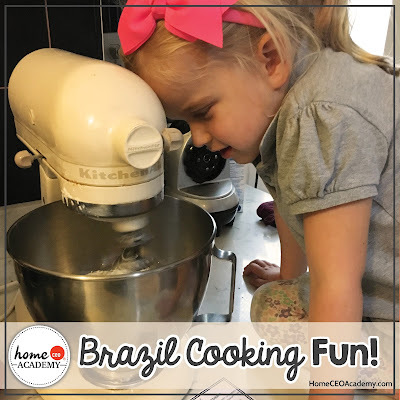 Our Brazil unit taught us how to make the delicious dessert "passion fruit fool"! If your grocery store doesn't have passion fruit, mango or papaya substitutes well. 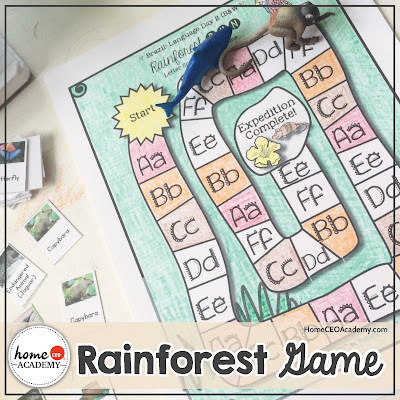 "Rainforest Run" was one of our language activities for Brazil. 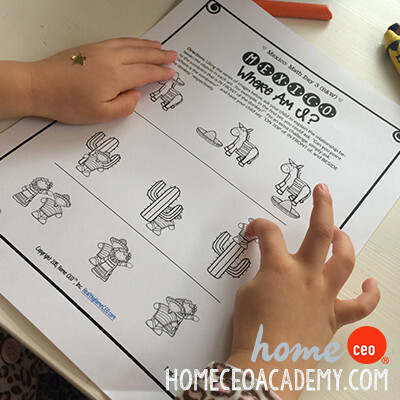 Did you know that our units come with black and white and full color printables? I printed this game in black and white and colored it in. 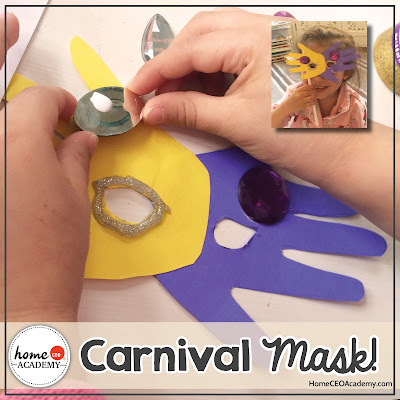 Our art project for the week was a Carnival mask! You can't learn about Brazil without kicking a soccer ball around! 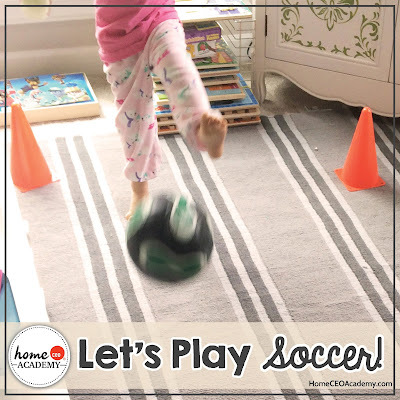 Soccer was one of our three gross motor games from this unit. I yelled "GOOOAAAL" each time Lovebug made a goal. We loved learning about Brazil! To get this unit, click here. Hola! 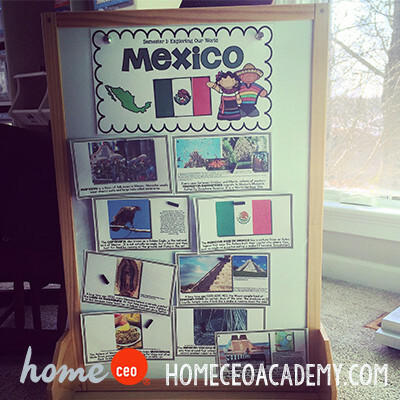 We really enjoyed the Mexico unit in our preschool homeschool Age 4 curriculum. 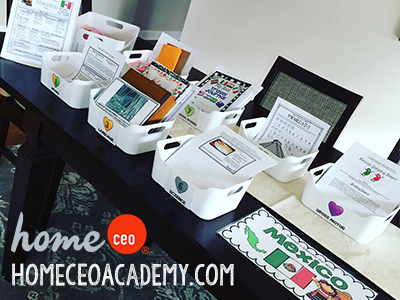 Mexico is week 2 of our 30-week program and is the second week of our first semester "Exploring Our World", where we are learning about 12 different countries. We start each week with our bins. I print what's in the unit and put any other supplies in the bin the Sunday before. It took about only about 20 minutes to set up these bins for the week. 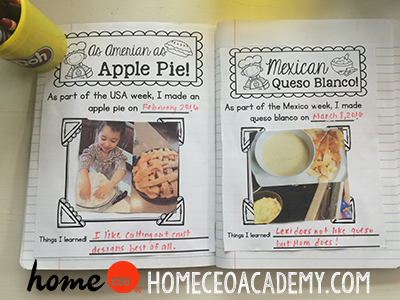 It's always a good idea to read the unit in advance to take note of what supplies are needed for the craft project or the recipe for the week. 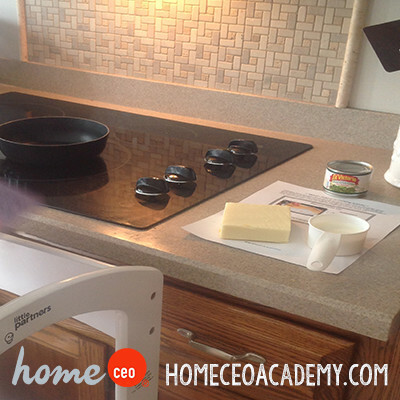 (The supplies are most often basic). This was our theme board for this week. We added three images per day. This is our circle time board. 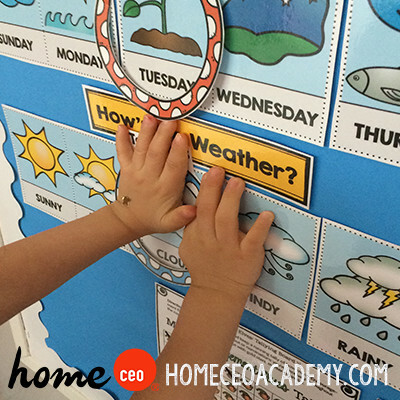 Each day we do the Days of the Week, Hows the Weather, and the Months Chant songs from Super Simple Songs. We put a gold star on each day of the week on a calendar (not shown). These moveable circles record the daily changes in the day of the week and the weather. After circle time every day, we do Wake Up Warm Up, which are daily short math and language arts reviews. Then we get to the other activities, some of which are shown below. These were our special book selections for the week. As always, we get most books from the library, however we added Migrant to our personal library. 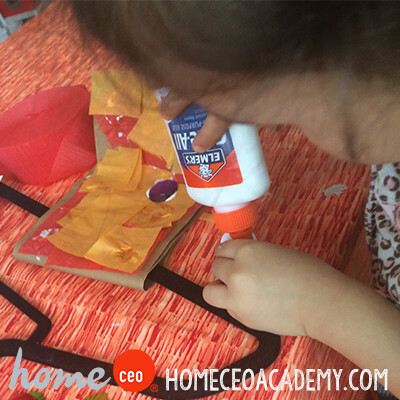 Our language activities included the letters c and d letter crafts (sorry for the bad photo and it actually shows d and e here). 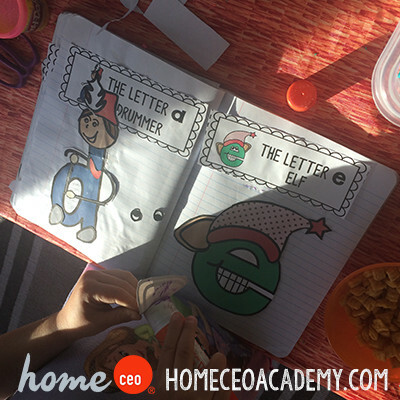 Our school did the Letter c cat and the Letter d drummer. 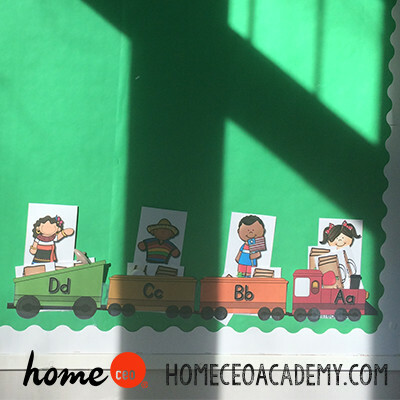 We are now up to letter D on our Letter Sounds Train! Lexi placed Carlos and Dolores, students from Mexico into the letter c and d cars respectively and put their letter c and d luggage cards into the cars with them. 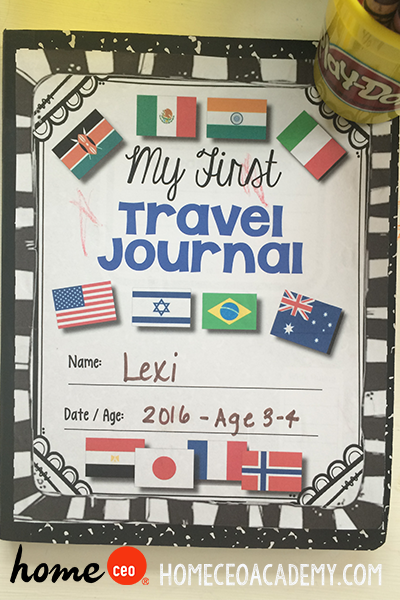 We did a letter C and D cut and paste activity and went ahead and pasted this into Lexi's My First Travel Journal. This is the cover of the My First Travel Journal. Throughout our 30 week program we are adding to this. These are some pages on the map and location of Mexico. 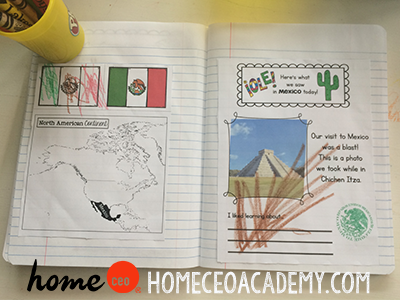 We are focusing on recall of the national flag and country location on these pages and also a stuffed plush globe we have in our homeschool classroom. For the art activity, we did a paper bag piñata. 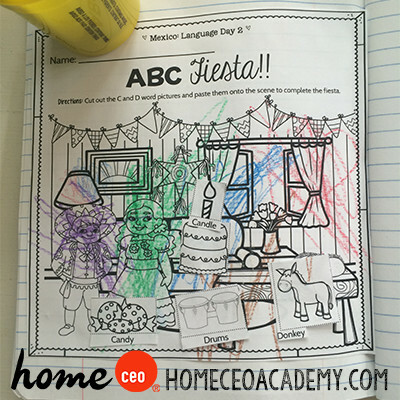 This is an easier version of a piñata that is perfect for preschoolers. Our rolling poster cart worked our perfectly for batting the piñata! This is a Lakeshore Learning cart, which by the way has been a helpful tool in our classroom and wasn't too expensive. It really helps when you need extra wall space but don't have it! For math in this unit, Lexi practiced her counting and quantity / symbol recognition and drawing circles with a Mexico 123 activity. 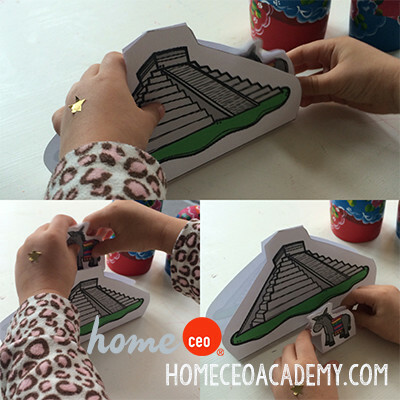 We practiced spacial relationships with this "Chitchen Itza Explorers" 3D activity. We also did some spacial relationship activities during the Wake Up Warm Up activities. Lexi pointing to objects, beside, behind and in front of, etc. There were three gross motor activities. 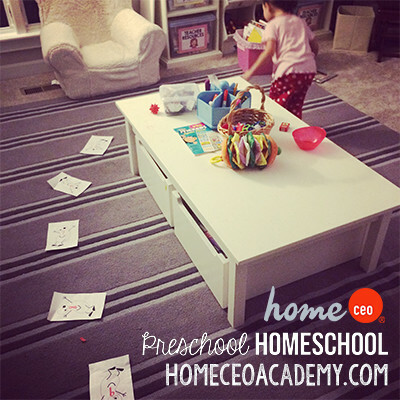 This is one of them - a jumping bean activity. Lexi jumped and counted at the same time. 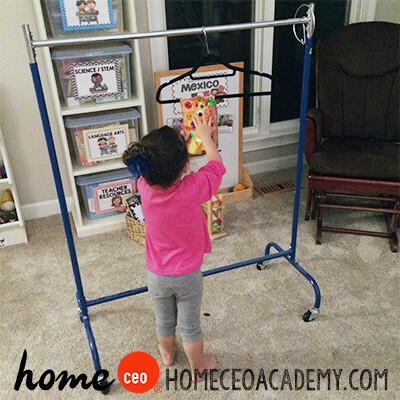 This was very easy to setup, was very active for the little one and she was very engaged in this activity. 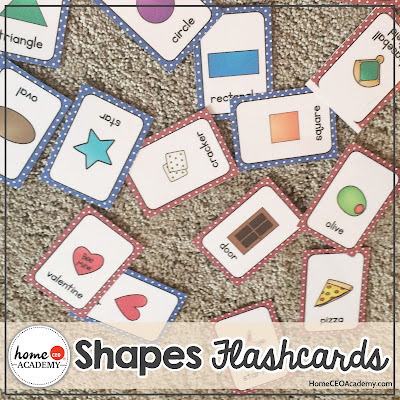 This unit is part of our 30-week Preschool Homeschool curriculum complete year bundle, or can be purchased separately, here.